Edward Livingston Davis procured this mosaic portrait of Christopher Columbus by Salviati in Italy in 1878. Upon his return to the US, he presented it to the American Antiquarian Society, an organization founded in 1812 to preserve the cultural heritage of the colonies that eventually became the United States of America. The portrait was originally housed on the north partition of the Annex in the second Antiquarian Hall, on Lincoln Square at the corner of Highland Street, beside the Worcester County Courthouse. While the Hall was built in 1853 by architect Thomas H. Tefft, the Annex was added in 1878 by Stephen C. Earle. After a new building was constructed in 1910, the mosaic's original ebony frame was removed and the portrait was set in plaster over the door in the society's Council Room of the third Antiquarian Hall. Today, the Venetian mosaic portrait of Christopher Columbus hangs in the building's main Reading Room, among the society's many painted portraits. "Mosaic of Columbus That Shows Discoverer's Haunting Look." The Spokesman. October 7, 1933. 25. 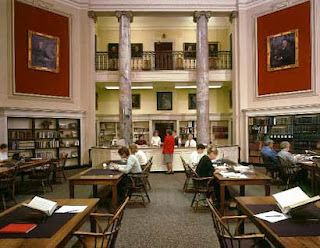 Weis, Frederick L. Checklist of the Portraits in the Library of the American Antiquarian Society. April 1946. 73. Reynolds, Mary Robinson. 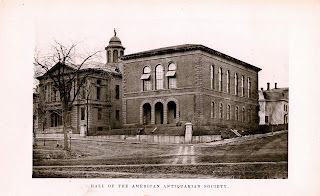 Recollections of Sixty Years of Service in the American Antiquarian Society. April 1945.